Root canal treatment, also known as endodontics, is a dental procedure designed to treat infection or decay that has occurred at the centre of the tooth. 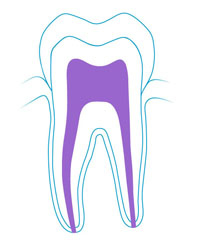 The pulp has a path that runs down through the inside of the tooth (marked here in purple) and into the gum and jawbone. This path is known as a root canal because it helps to keep the tooth rooted in place. In some cases, a single tooth can have more than one root canal. The term root canal is slightly misleading because it implies that the pulp and the root canal of the tooth are empty. However, the pulp and the root canal are made up of soft tissue that contains nerves and blood vessels. If the pulp becomes infected by bacteria it will begin to die, which could result in the loss of the tooth. There is also the risk that the infection could spread down into the root canal, which may lead to the development of a painful dental abscess (a pus-filled swelling). The infection could then spread to your gums (gingivitis) or the tissue and bones that support your teeth (periodontitis). Root canal treatment is designed to save the tooth and prevent the spread of infection. The damaged pulp is removed from the tooth and the root canal is then cleaned of all bacteria. After the bacteria has been removed, the root canal and pulp are filled in using an artificial substance, before being sealed. Root canal treatment is commonly perceived as being a painful procedure. In fact, in the hands of a properly trained dentist, root canal treatment is relatively painless, and it should be no more unpleasant than having a filling done. Root canal is performed under NHS Band 2, however, some cases can be quite complex and the root form difficult to clean out. In these cases your dentist may suggest you be referred to an Endodontist to improve the success rate of the treatment. An Endodontist is a dentist with specialist training, equipment and experience to deal with them well. A specialist will use a surgical microscope during treatment, to magnify the tooth to approximately x20, to enhance success rates. Unfortunately, there are no Endodontic provisions under the NHS. Options available are Private referral or Referral to Dental Hospital for treatment by a Trainee Endodontist, however, the wait for this option can be very lengthy. If your dentist recommends referral to an Endodontist, your options and reason for referral will be discussed thoroughly. Root canal treatment involves cleaning the infected or damaged pulp tissue from inside the tooth and replacing it with a permanent filling material called gutta-percha. The treatment can often be done in one session, or occasionally multiple visits. In these scenarios your dentist may refer you to a dentist with enhanced skills in Endodontics. At Boston Dental Centre, Dr Anand Subramanian accepts private patients directly and referrals from practices all over the Lincolnshire. He has successfully completed a 2 year Post Graduate Diploma in Endodontics at the prestigious-Kings College London which he passed with a Distinction. Endodontic treatment carried out at Boston Dental Centre is completed using a surgical microscope, is private only which allows for superior visualisation of the small root canals and more optimal cleaning. Often there are ‘additional’ root canals which are found using a microscope and these are all sources of bacteria which could lead to future infections or failed treatment if not found. Endodontic treatment has a high success rate. Even if previous root canal has failed, it is possible in many cases to re-do the treatment with a successful outcome, rather than having the tooth extracted. Advanced ENDODONTICS treatments with microscope in Boston Dental Centre only provided on private basis.